Vapor Chamber Quick Calculations – Do I Need One? In this blog, I’d like to take you through the early steps I take when determining if a two-phase device, specifically a vapor chamber, might be needed as part of the thermal solution. I’ll eventually do a complementary piece on heat pipes, but in the interest of brevity we’ll stick with a copper vapor chamber with a sintered wick and water as the working fluid. If you’ve read some of my previous articles, you know that for the vast majority of two-phase applications where heat is being moved from the heat source to a remote condenser – heat pipes trump vapor chambers. It’s not because they’re necessarily better at moving heat. It’s because the path from the evaporator to condenser usually requires some twists and turns – not typically a strong suite of vapor chambers. Vapor chambers, as seen above on the left, are typically used to spread heat to a local condenser/heat sink who’s required area is minimally 10 times bigger than the area of the heat source. When heat needs to be moved to a remote condenser, distances of greater than 40 or 50mm are generally required for two-phase devices to make sense. Even before doing any calculations, I know there are several circumstances where vapor chambers are useful. Simply speaking, your thermal budget is calculated by subtracting the maximum ambient temperature in which the device will operate (Tambient) from the maximum allowable temperature of the IC case (Tcase) or in some cases the Tjunction if there isn’t a built-in spreader on the chip. Typical thermal budgets for electronic components are in the range of 30-50 oC. Let’s assume we’ve been given a Tcase max by the manufacturer or ASIC designer of 85 oC. Further, we need our device to operate at temperatures up to 45 oC. This leaves us with a total thermal budget of 40 oC. This means that the total of all our individual delta Ts from the case to the air cannot exceed this figure. Found on our website, this calculator quickly provides the overall volume of the heat sink based on heat source power, Tcase , max ambient temperature and available airflow. Obviously, if you’ve already done the detailed calcs for required heat sink size, you can skip this step. I like to know this figure because it quickly allows me to estimate specific dimensions – allowing me to understand if the heat sink base will be substantially larger than the heat source. We already know that our Tcase is 85 oC and our Tambient is 45 oC. This leaves a thermal budet of 40 oC. With an estimated volume of 375cm3, I can begin to make some estimates of dimensions. I’ll start by fixing the fin height to a reasonable 27mm and tacking on 3 mm for the base height. Pretty standard. Then I’ll adjust the length and wide dimensions to reach the specified volume estimate. In this case the heat sink dimensions would be roughly 110 x 110 x 30mm. I can play with the dimensions mentioned earlier and compare it to the proposed system layout. Given that were talking about vapor chambers, I’m going to assume that we have the desire and space to use a local heat sink. 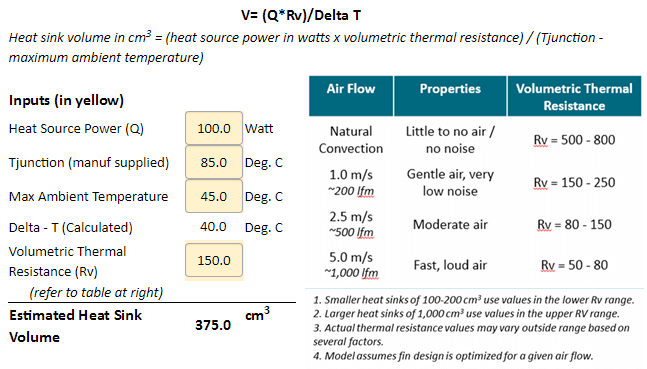 However, if it turned out that we wanted or needed a remote heat sink whose distance between evaporator and condenser was greater than 40 or 50mm, I’d be doing a different calculation for Step 3 in order to evaluate a heat pipe solution. As it stands for this example, we’re going to use a local sink. First, I see that the area of the heat sink is 15 times larger than the area of the heat sink. This already suggests a vapor chamber may be in order. I also know that the total thermal budget is 40 oC. 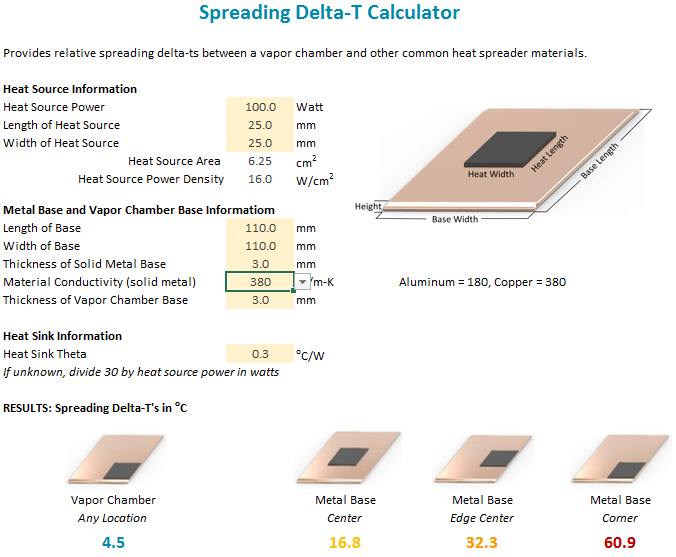 Next, I’ll use another calculator we have online to understand the spreading delta-T in the base for solid aluminum and copper as well as for a vapor chamber. Populate the inputs with our earlier assumptions and select between an aluminum or copper base by changing the material conductivity in the calculator. Also, let’s assume the heat source is in the center of the base. Consider a vapor chamber when the spreading resistance in a solid base is greater than 10 oC. The solid aluminum base in this example (not shown) has a delta-T of 34.5 o If we’ve got room we could double the base thickness, lowing the delta-T to 19 oC. But that’s almost half our thermal budget and substantially more than the 10 degree rule of thumb. Switching to a 3mm copper base (shown above), with a thermal conductivity of 380 W/m-K, gives us a base delta-T of 16.8 o By increasing the base thickness to 5mm, I’m within striking distance of the 10 degree rule of thumb, but it’s certainly going to increase weight and potentially decrease fin height. If these tradeoffs are acceptable later in the design process, a solid copper base might make sense. But, compare the 5mm solid copper base (10.7 oC) to the vapor chamber base (4.5 oC). The vapor chamber is going to be thinner, about half the weight and potentially give us other design options such as alternative TIM choices. As stated in the beginning of this article, this method is great for initial estimates as it gives you both the heat sink volume and a good feel for the likelihood of a vapor chamber base. After using the same parameters as mentioned above, and fiddling with fin characteristics, I used a more sophisticated model to calculate the remaining delta-Ts. As you can see from the above chart, using a vapor chamber puts us 3.3 degrees below our thermal budget. 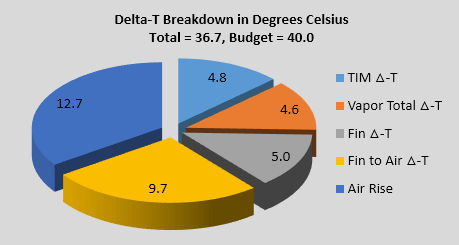 Note, the TIM delta-T of 4.8 oC. used thermal grease for this calculation, but I could switch to a high conductivity thermal pad (which will make the manufacturing engineers happy) and still remain below my thermal budget.